The celebration of Abraham Lincoln's birth kicked off in earnest on his birthday, Feb. 12, with the launch of the 2009 Lincoln Bicentennial Silver Dollar Coins and the first release of four newly redesigned Lincoln cents. New First-Class Lincoln commemorative stamps issued on Monday, Feb. 9, started the 200th anniversary celebratory ball rolling. The 42-cent stamps -- officially unveiled at the Old State Capitol State Historic Site in Springfield, IL -- chronicle Lincoln's life as a rail-splitter, lawyer, politician and a president. The commemorative silver coins -- now released in proof and uncirculated versions -- depict a different theme from the cents or stamps. Lincoln Silver Dollar designs were revealed by the United States Mint on Nov. 19 during the annual Dedication Day Ceremony at Soldiers' National Cemetery in Gettysburg. The timing was particularly appropriate as it was the 145th anniversary of the cemetery's dedication by Lincoln and his historic Gettysburg Address. The final words of which are inscribed within a laurel wreath on the Lincoln silver dollar reverse. WE HERE HIGHLY RESOLVE THAT THESE DEAD SHALL NOT HAVE DIED IN VAIN - THAT THIS NATION, UNDER GOD, SHALL HAVE A NEW BIRTH OF FREEDOM - AND THAT GOVERNMENT OF THE PEOPLE, BY THE PEOPLE, FOR THE PEOPLE, SHALL NOT PERISH FROM THE EARTH. The reverse was designed and executed by United States Mint Sculptor-Engraver Phebe Hemphill. The obverse, or "heads" side of the coin portrays Lincoln, and was inspired by Daniel Chester French's famous sculpture of the President inside the Lincoln Memorial in Washington, D.C. It was designed by Justin Kunz and engraved by Don Everhart. * Up to 500,000 across all product options, including the special set. ** The price and launch date for the special 5-coin set has not yet been determined. The US Mint will also accept orders for the Abraham Lincoln Commemorative Silver Dollar at www.usmint.gov or at 1-800-USA-MINT (872-6468). 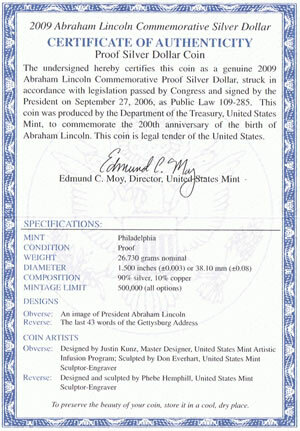 Excerpts of the above content provided by Silver Coins Today from the page Lincoln Silver Dollars. 2009 Lincoln Cent Presidency in Washington, DC. Designed by Justin Kunz, sculpted by Don Everhart. Designed and sculpted by Phebe Hemphill.